GELATINA DI MAIALE and HAPPY BIRTHDAY BAR IDDA (Buon Compleanno Bar Idda). 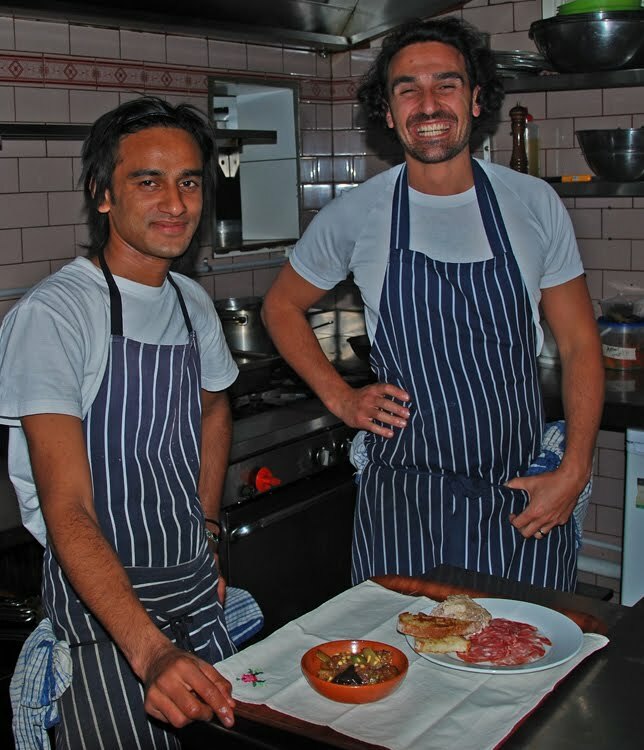 The happy chefs of Bar Idda (photo). Lisa and Alfredo (right) are the proprietors of Bar Idda in Lygon Street. 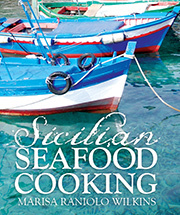 They have returned from their holiday in Sicily full of ideas and enthusiasm for their small, Sicilian restaurant. On the 5t of July they celebrated their first birthday and their new menu strongly influenced by their recent discoveries of different recipes experienced while in Sicily. SICILIAN CHEESE. A VISIT TO A MASSARO (farmer-cheese maker) IN RAGUSA. 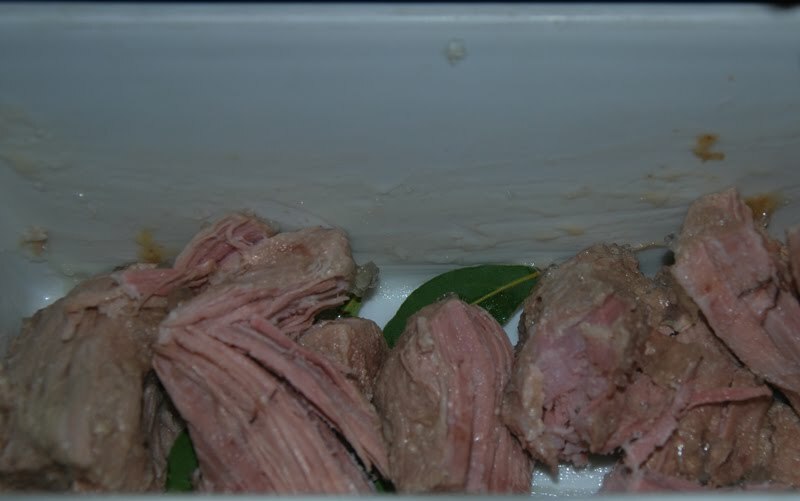 Gelatina di maiale (brawn, made with pork- see recipe and photos below) and some affettati (a selection of cold cuts of salumi). An eggplant caponata was also included in this antipasto. (See recipe CAPONATA SICILIANA). Farsumagru (il falsomagro is a beef, meat roll stuffed with hard boiled egg and can include cheeses , salamini and mortadella). It is braised in a tomato sauce and presented sliced. In this case it was made with minced beef and Alfredo’s version included a little zucchini for colour and variety of textures. Farsumagru translates into false–lean. It contains delectable ingredients including meat, so this is a pun on ‘lenten’ food – during the liturgical seasons Catholics were required to eat simple food and to abstain from eating meat. These laws have relaxed over time. The farsumagru was accompanied by a warm potato salad with capers and comichons, and a fennel and orange salad with a sprinkling of pomegranate seeds. We then had a glass of Malvasia a very rich flavoured dessert wine made by drying Malvasia grapes (bianche– white variety) before crushing. It was an excellent accompaniment to the small fried pastries called cassateddi. There are many local variations to this recipe, and in this version the dough was stuffed with ricotta, cinnamon, and honey. I could taste some alcohol too. (Honey is used instead of sugar in the Ragusa area). Thank you Bar Idda, for a very enjoyable meal. Auguri e complimenti and may there be many years to come. Gelatina (means gelatine or jellied). It is sold as a Smallgoods food. In various parts of Sicily the gelatina di maiale is called by a variety of names: jlatina di maiali, Suzu, suzzu, or zuzu. I found a recipe for gelatina scribbled in one of many notebooks which I use to record recipes when I visit Italy. In this particular notebook from 1980, there are many Sicilian recipes, but on this particular trip I must have visited the relatives in Genova (a Piedmontese aunt married to my father’s brother and living in Genova and her daughter Rosadele who is an excellent cook also). There were also some recipes written in Trieste (my zia Renata was from Rovigo and married my mother’s brother). 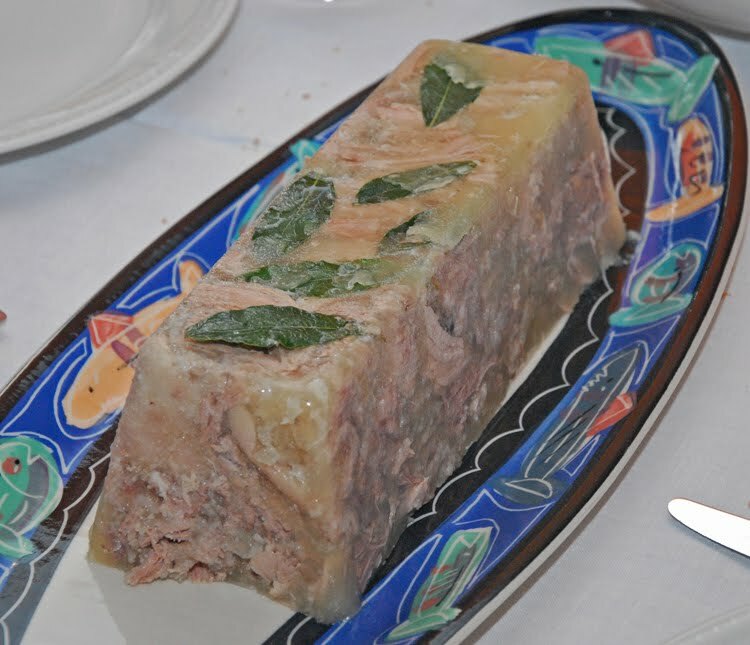 I have not made gelatina di maiale for many years but I have always included a half of a pork’s head – this provides the jelly component. The tongue adds texture and extra flavour (you can throw out the eyes). It is always a good idea to pre-order a pork’s head beforehand and I was not able to purchase one. I used pork feet instead (as you can see by this photo) and fortunately it turned out very well. In this gelatina I included approx 1.500 kilo of lean pork (cut into large pieces) and four pig’s feet. 1 part vinegar to 3 parts of water, red chilli flakes or whole pepper corns and salt. 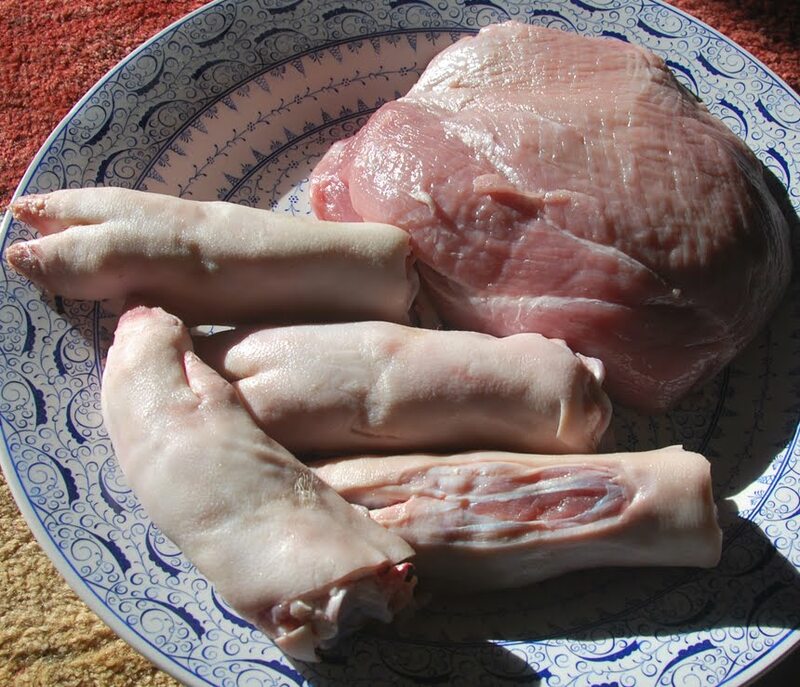 Use a mixed selection of pork meat, including the head. Place in cold water mixture, cover meat. Boil for 6 hours (covered) on slow heat. Filter broth, remove some of the fat and reduce, remove bones, shred meat. Lay meat in earthenware bowl, cover with cooled broth and leave to set. Over time, I have altered the recipe and include bay leaves and peppercorns and I boil the pork without the vinegar only for about 3 hours (until I can see the meat falling off the bones). I shred the meat and place it into a terrine and cover it with the cooled reduced stock. Any fat will rise to the surface and can be scraped off when it is cool (in fact, it acts as a seal). Recipe and photo of the FARSUMAGRO I make. Calamari is the Italian word for squid and it refers to those species of squid with long side fins; those with relatively shorter side fins are seppie (cuttlefish). This recipe is for seppie, but squid is much easier to buy in Australia although the two species are sometimes sold interchangeably and sold as calamari. They are found right around the Australian coast and are available year round. Commercially they are wild-caught mainly by seafloor trawling and many end up as bycatch in nets. Squid jags are a favourite with recreational fishers. They generally are a fast growing species and for this reason are considered sustainable. In Australia squid was once only used for bait and be very cheaply priced, but unfortunately, too many people have come to appreciate it and the price has gone up significantly. Many of the rings and tubes sold are imported. There is also local product and this may not have been frozen, but the flesh can be tough – usually they are from much bigger squids than I would generally buy. Unfortunately the tentacles (very tasty) are generally removed for easier processing and packing in ice, ready for export. I am very spoiled when I buy squid from my fish vendor at Happy Tuna in the Queen Victoria Market where I shop. It is so fresh that it could easily be eaten raw or needs very little cooking. My favourite vendors always select for me small and medium sized squid, which they know I prefer. The photo is from the fish market in Siracusa, Sicilia and it shows the common size for squid sold in Italy. This recipe is a wet pasta dish – a common consistency for Sicilian soups which generally contain a large amount of pasta. What I like about this recipe (from Mazara del Vallo, on the west coast of Sicily) is the addition of carrot and potato – two very popular ingredients in Australia, but not so popular in pasta dishes in Sicily. The squid used are young, small cuttlefish or squid – the smaller ones are considered more tender. chili flakes and/or grated pecorino (optional) to taste. Sauté the onion in ½ cup of oil, add the potato and carrot and when the ingredients begin to brown add the garlic. Add the tomatoes, a little salt, and the parsley and over medium evaporate some of the juices. Check that the potatoes and carrots are cooked and if they are not, add some liquid (water or wine) and cook for a little longer and do not drain. Sauté the squid in ½ cup of oil – use a separate, wide fry pan (it cannot be overcrowded or it will stew). Toss the squid around in the pan on high heat for a few minutes, add a little salt, wine and seasoning and evaporate. Add the squid to the vegetable mixture. Combine the pasta with the sauce. Add the basil leaves and serve. Sprinkle with chili flakes and/or grated cheese. It has been a while since I have had an Easter in Sicily and I am feeling very nostalgic. This year, a large group of my relatives in Ragusa are all going to celebrate lunch at Stefania and Aurelio’s country house, just outside Ragusa and I wish I could be with them.The country house is a stable which in the 18 Century belonged to a local Baron called La Rocca. Stefania and Aurelio bought the property several years ago (it also has a few surrounding buildings and land) and they are slowly converting it into a beautiful holiday home. They are using local artisans to recreate and restore many features in the original style and character. As much as possible they have kept its original outside appearance and interior features, especially the original carved wooden ceiling. I do miss my relatives (and the feast that they will be sharing), but I also miss Spring in Sicily. In Sicily, spring is the start of everything. It is the time when the island comes alive – flowers bloom, vines sprout and vegetables ripen. Spring is the celebration of life, which in cultural and religious terms is expressed in Easter. In Sicily Primavera (Spring) and Pasqua (Easter) are a fusion of nature and culture, family and food. The ancient Greeks (once settlers in Sicily) also marked spring and – like the Christian Easter – their myth celebrated another resurrection from the dead through the legend of Persephone. The Greeks considered Sicily to be Persephone’s island because, according to the myth, Pluto, the god of Hades, who imprisoned her in his underworld realm, abducted Persephone from the Sicilian town of Enna. So Persephone’s grieving mother, the goddess Demeter, (goddess of agriculture) plunged the island into a barren winter, until Zeus, the father of the gods, struck a bargain with Pluto to let Persephone to return to land of the living for six months of the year. So it is that when Persephone is released from Hades, Demeter allowed the world to thaw and bloom before her daughter must once again return to Pluto and Hades. The pagan traditions were slightly transformed and unofficially accepted into the rites surrounding devotion to the Christian saints. Offerings of bread, cheeses, and sweets, associated with pagan harvest rituals, are common in many of the present-day festivals. Some of the foods the relatives will be eating are on my previous posts. There will also be baked capretto (kid) and wild spring greens collected from their property and sauteed in virgin olive oil and garlic (see top photos, taken at one of the other family feasts in the country house). They will be buying cassata from the pasticceria (pastry shop) and making cassatedde. In Ragusa (and nearby Modica) these are little baked tarts with a pastry bottom and a ricotta, sugar, egg and cinnamon. Some add candied orange. In the rest of Sicily, cassatedde are ravioli like pastries and fried. The pasta will be a must. Zia Niluzza will be making gnucchateddi (causunedda) all night for so many people! ( She never takes off her jewellery when making pasta). She may even make large ricotta ravioli with a strong ragu made with pork and conserva (strong tomato paste). And small sweets: Cotogniata (quince paste) rolled in sugar and Giuggiulena (or sesame seed torrone). It is also called Cubbaita and is said to be a legacy from the Arabs who lived in Sicily. Pour mixture onto a tray with baking paper or a marble that has been coated with oil. Spread evenly and quickly before the torrone hardens, cut into rectangular pieces before it cools and store in airtight containers. Aurelio with one of his horses on the property. One of the many lunches at the property. On this occasion the local cheese makers were invited…..this is why there are all those men at the table. They bought cheeses for us to taste. Maccarruna (maccheroni in Italian) is sometimes used as the generic word for pasta and is still common, especially in Naples and Sicily. It is also the term used in ancient recipe books. Most pasta, of whatever sort, was labelled maccheroni until 1850-70, after which local folk names were widely adopted by producers and consumers. There are many explanations for the origins of the term maccarruna. Some researchers believe that it comes from the term, maccare – to squash. Others believe that it comes from the word maccu – a Sicilian, thick soup specialty made with pulses and pasta. There are also Greek words: macron meaning long, or makaria a dough of barley and broth, or makar – it means ‘very happy’ – the state maccarruna eaters presumably experience. Whatever the origins of the word maccarruna, Sicilians consume large quantities of it. 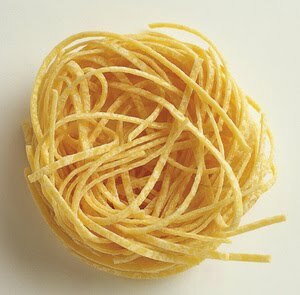 There are many small shapes of fresh pasta made in Sicilian homes. The following are some of the favourite maccarruna. Gnocculi, gnucchiteddi, cavati, caviateddi are the most common names for gnocchi or gnocchetti (Italian) shapes. Some are rigati (have ridges on the surface) and some are lisci (smooth). All have an indentation in the centre to ensure even cooking. Gnocchi look like dumplings and in Italy can be made out of potatoes, bread, fine cornmeal or semolina and with wheat flour. Sicilians prefer gnocculi or gnucchiteddi (the smaller shape), made with durum wheat flour. They are called different names in different regions in Sicily. When my relatives in Ragusa make gnucchiteddi, they include 1-2 eggs for each 800g-1k of durum wheat flour and as much water as the dough absorbs, but the standard practice in other parts of Sicily is to use no eggs at all. Pasta making is a family affair. The photo was taken during my last trip to Sicily. The extended family is shaping gnucchiteddi by using a very useful gadget that belonged to my great grandmother. As you can see it looks like a loom. Very fine strips of dough are rolled around a needle-like reed and then the reed (and the shapes) are rolled on the shaping device. This fuses the dough together and gives each of the gnucchiteddi, the grooves on the surface. 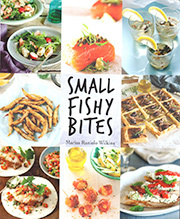 Laura and Nancy in the U.S. have a great food blog called ‘Jellypress’. They invite readers to share photos of old foodways called ‘Hands on’ and I have contributed to this very interesting section in their blog.